And get your copy of Poseidon’s Children here. “Cinema of Shadows” Becomes Most Downloaded Horror Title on Kindle! 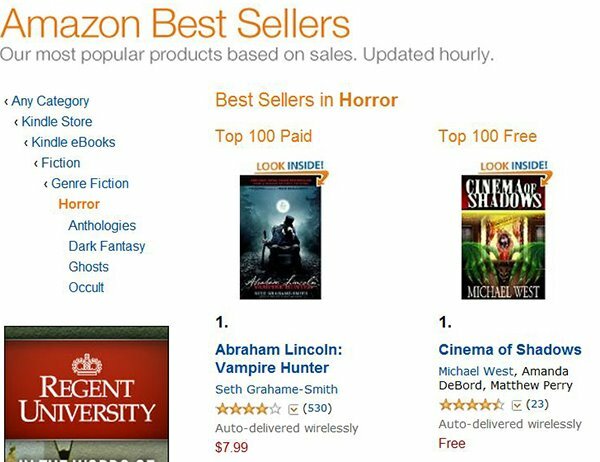 My Harmony, Indiana novel Cinema of Shadows just became the most downloaded Horror title for Amazon’s Kindle (Yes, it takes more units to top the free charts). As someone who has loved Horror for as long as they can remember, I must admit that this took my breath away. When I was in the 8th grade, I read my first Stephen King novel: The Shining. If you had told me back then that I would one day go on to write about a haunting of my own, and that said novel would then go on to top the charts, I would have said that you were crazy. But here it is, a reality. I want to thank all my faithful readers, and my publisher, Seventh Star Press, for making this a reality. Your support means the world to me! Now, off to make myself some coffee to celebrate, and then right back to work on more horrific tales! Fantasy Book Review Gives Poseidon’s Children Almost Perfect 9 out of 10!